Bovine ileum tissue section with Ziehl-Neelson acid-fast stain magnified ~400 times. 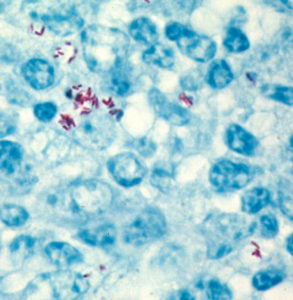 MAP bacteria (red) are clustered inside macrophages. Mononuclear inflammatory cells, macrophages and lymphocytes, surround the infected macrophages. In cattle with late-stage Johne’s disease, MAP bacteria are typically numerous as shown here. This is the so called “multibacillary” or “lepromatous” (meaning similar to advanced forms of leprosy) type of infection. The host response is called diffuse granulomatous inflammation, similar to what is seen in human leprosy and Crohn’s disease (although acid-fast bacteria are generally not seen in Crohn’s disease). This inflammation is different from what is seen in tuberculosis where the inflammation is organized into a walled-off granuloma. 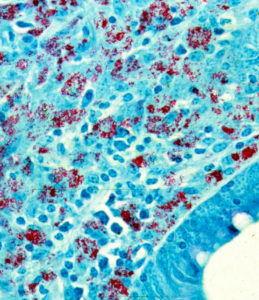 Bovine mesenteric lymph node section stained with Ziehl-Neelsen acid-fast stain (magnified 250x) showing the tiny red-colored MAP bacteria inside macrophages. Look closely and see below for a higher magnification. 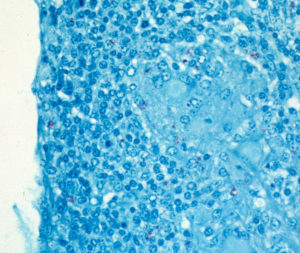 High power (1,000x) magnification of the image above showing how important it is to use special, acid-fast, stains and to look at the histopathology at magnification provided by an oil immersion lens to clearly see MAP bacteria in lesions. 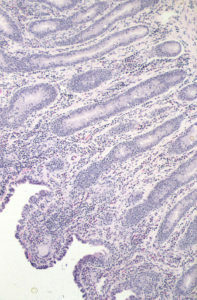 H&E stained section of bovine intestine showing the granulomatous inflammation characteristic of Johne’s disease. Multi-nucleated giant cell commonly found in the granulomatous inflammation caused by MAP in cattle. Granulomatous inflammation of the intestine and regional lymph nodes is indicative of MAP infection. Acid-fast (red staining) MAP bacteria may be abundant, sparse or even undetectable depending on the animal species affected.